It’s always nice to be informed. Attention all S&R parkers (we mean shoppers): There are new parking fees in S&R Alabang. 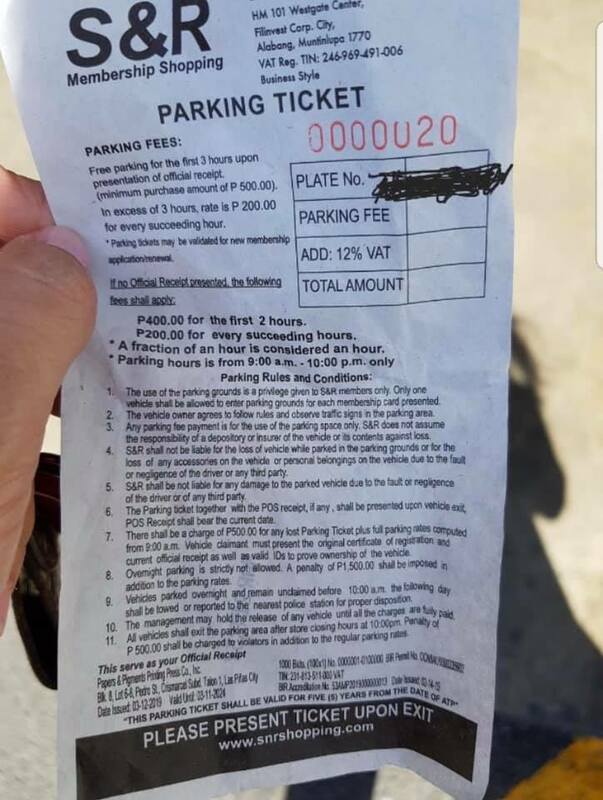 In a post by a villager on Facebook, it was revealed that parking there can cost you P400 for the first two hours. That is if you don’t spend P500 there. On the ticket, it says: “Free parking for the first 3 hours upon presentation of official receipt (minimum purchase amount of P500). Credits to Owner who wanted to remain anonymous. After the first three hours (if you don’t reach the minimum purchase requirement), the rate will be P200 for every succeeding hour. P400 for the first 2 hours. P200 for every succeeding hours. 1. The use of the parking grounds is a privilege given to S&R members only. Only one vehicle shall be allowed to enter parking grounds for each membership card presented. 4. Vehicles parked overnight and remain unclaimed before 10am the following day shall be towed or reported to the nearest police station for proper disposition. 5. Parking can be validated for new membership applications and renewals. Please be guided by the new parking rates and please share with your friends. We heard that this is to discourage people who park their vehicles in S&R then go to other destinations like their offices since the parking there used to be free. So for those planning to visit S&R Alabang, we suggest you prepare your shopping list before going to make sure you go over the P500 minimum spend. By law, they have to grant discount. Dapt report yan kapag ganyan wag na ninyong tangkilikin ang S & R mandurungas…..masyadong abusado…. WHAT ABOUT FOR SENIOR CITIZEN AND PWD CUSTOMER . Hopefully they still honor that. Tama lang naman. They just wanna make sure that the people parking there are their customers. Normal naman umabot mg 500 min gastos sa s&r plus 3 hours is more than enough for eating and buying groceries.